I’ve been spending a lot of time reflecting and gathering my thoughts after hearing the news of Scott Hutchison’s passing. As many before me have already said, his music was a great gift and a bright light to many fans that followed his journey and he will be missed tremendously. He helped many people who struggled with mental health issues through his songwriting, the awareness his open discussion of his own struggles brought, and even taking time to reach out personally to people who needed it. It’s very apparent that he had a strong positive influence on people, and you can see that yourself reading the thousands of messages that have been pouring into social media in his memory. Music is such a powerful force, and something that connects us all on an emotional level. Whether the emotion is one of joy or sadness (or anything in between), we can all find a sense of connection that reminds us that we are all on this journey of life together. I invite all of you to spend some time listening to some music that means something to you today, and if you have never listened to Scott’s music (Via Frightened Rabbit, Owl John, or mastersystem), I invite you to take some time and do so as well. Scott’s passing is a devastating loss, and it’s important we carry on his memory and spread the light he carried in his time with us. If you do nothing else today, reach out to someone you care about and let them know how much they mean to you. I want to close this out by sharing a few links to some of the resources you can turn to if you or someone you know is suffering. There is always someone ready to listen and help. Website links are attached to the name of the organization. Thank you so much for taking the time to read through today’s message. Please consider doing your part to spread awareness for mental health illness and pass along any of these provided links via social media, and consider donating if you have the means. To Scott’s family and friends, you have all been heavily on my mind this week. I hope that time provides healing for you all. I hope you find comfort in knowing his legacy will continue to provide a message of hope and light to others that need it, and many are already stepping up to carry that torch that he held in his time with us. The 5 song EP will be the first official release from Honest Horse in over 3 years. Déjà Vu will be available for purchase on June 30, 2017 everywhere digital music is sold including iTunes, Spotify, Bandcamp, Google Play, and Amazon. The EP will be available for pre-order on iTunes and Bandcamp June 2, 2017. All pre-orders on Bandcamp will have the title track Déjà Vu available for immediate download. 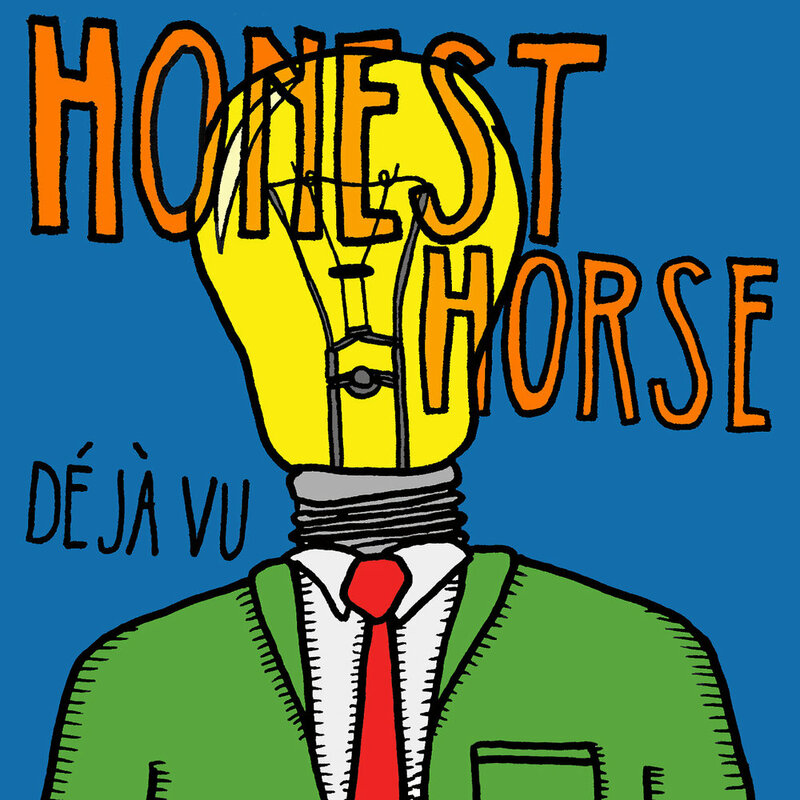 Déjà Vu was written and recorded by Honest Horse in Long Beach, CA. Mixing was done by Andy Beargie of Blockhouse Studios (Bloomington, IN) and mastering done by Eric Day of Sleepwalk Recording (New York, NY). Album artwork by Josh Morrow (Indianapolis, IN). Stay tuned for more information and announcement soon! I want to start by thanking everyone that purchased the acoustic version of “Deja Vu” yesterday! As you may know, yesterday Bandcamp held a fundraiser for the American Civil Liberties Union, and donated 100% of their revenue shares from purchases on the site. Inspired by their announcement earlier in the week, I decided to record a stripped down version of “Deja Vu” to upload on Friday and donate my portion of revenue from sales as well. In total, $157.00 was spent yesterday on the track! To break that down, Bandcamp will be donating their share of $23.55 (15%), a payment processing fee of $6.59 (4.2%) will go to PayPal for handling the transactions, and my share of $126.86 (80.8%) will also be donated to the ACLU. I’ve also decided that I am going to match Bandcamp’s 15% personally, which results in a grand total of $173.96 going directly to the ACLU thanks to the support of all of you who contributed! It’s going to take a few days for the purchases to all clear into an account, and once it all does I will be submitting the donation to the ACLU. I just want to thank you all again for taking the time and money out of your day to contribute to this fundraiser. It really warmed my heart to see the notifications coming in all day, and I am beyond thankful to have a way to contribute through my music! I’d also like to thank Bandcamp for giving artists and labels a platform to do this with ease, and motivate so many to contribute! I suggest you purchase your music on Bandcamp whenever possible. They’ve always had the artist’s best interest in mind with their business model. You can find out more about the total results from Bandcamp’s fundraiser at https://www.bandcamp.com I encourage anyone reading this that isn’t up to speed with what the ACLU does to visit their website https://www.aclu.org and learn more about this fantastic organization as well. 5 song EP “Deja Vu” coming in 2017! I’m very excited to announce that I am going to be releasing a 5 song EP in the coming months! While I am still working on an official release date due to certain aspects of the release still being under production, I’m aiming for an April release if all goes according to plan! I am going to start utilizing this page to send updates regarding the release, and everything in between. To give you an idea of where things are at, recording is complete and the songs are currently being mixed by Andy Beargie (http://www.blockhouse.media) in Bloomington, IN. From there the music will be heading to Eric Day (Sleepwalk Recording) in New York for mastering. Both of these guys are old friends of mine and I couldn’t be more pleased to have them involved! I still have a demo version of the title track, “Deja Vu”, that you can listen to on my website at http://www.honesthorsemusic.com/music if you want to catch that before it disappears. Otherwise feel free to find me on my various social media accounts for day-to-day updates as well. I’m looking forward to sharing more information about this release with you guys as it becomes available! Stay tuned! Sign up with your email address to receive exclusive Honest Horse news and updates! Your privacy is very important to us, and any information collected will be used solely for communications related to Honest Horse. That means we won't give out your information or send spam, EVER! Thank you so much for signing up! It really means a lot!